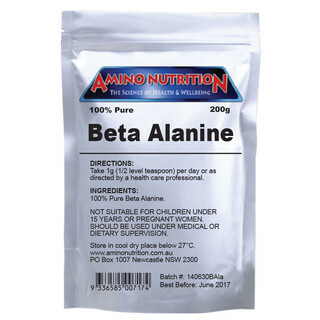 Beta Alanine is a naturally occurring beta- amino acid and a component of the histidine dipeptides carnosine and anserine, as well as vitamin B5, or pantothenic acid. Beta Alanine passes through the bloodstream into skeletal muscle via a beta alanine and taurine transporter that's dependent upon both sodium and chloride availability. Once it enters a skeletal muscle cell, it binds with the essential amino acid L-histidine to form the dipeptide carnosine. Beta Alanine can be found in pork, beef and tuna. Beta-alanine seems most effective for supporting excercise lasting longer than 60 seconds as it boosts high intensity muscle performance. 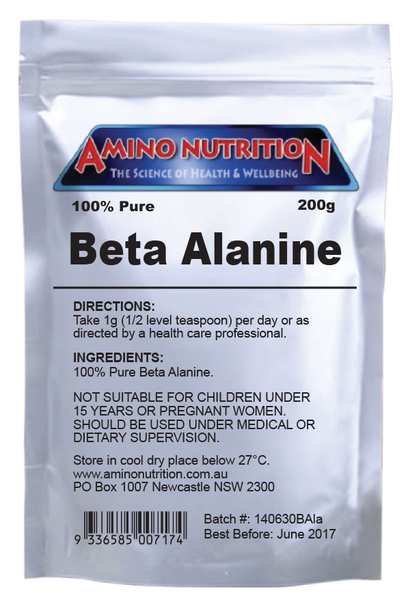 Beta Alanine can be taken with other nutrition supplements. Beta alanine may give the tingling sensation after consumed. Amino Nutrition recommends that the safe dose is 1 gram per day or as directed by a health care professional.